Insect harassment the summer before spring calving migration plays a large role in when the migration takes place, research finds. A new analysis of North American caribou pinpoints one reason for changes in migration and, potentially, for lower calving rates: insects. “Insects, in the summer, are the main drivers of caribou movements and behaviors,” said Eliezer Gurarie, a researcher at University of Maryland and author of the forthcoming study. But the insects, his research found, have lasting effects on caribou throughout the year. “A lot of insect harassment is generally an indicator of poorer condition, lower calving rates, later calving times — all of that’s linked together,” he told ArcticToday. Across the continent, caribou seem to know when to migrate at the same time. Yet those times can change year by year, and there was no discernible pattern. In 2014, for instance, all of the caribou began migrating much earlier than they had in 2013. This study looked at migration to the calving grounds each spring. Different migration times seem to have an effect on calving success. The study, which is a meta-analysis of seven migratory caribou herds across North America, looked at migration to calving grounds each spring and found that different migration times seem to have an effect on calving success. “This is an unprecedentedly large movement data set, extending 20 years in some cases and over a thousand animals,” he said. Gurarie began his research by looking at the connection between snow and migration; as it turns out, there isn’t one. Or, at least, the presence of snow does not delay migration; after all, caribou can travel easily over snow as long as it’s in good shape. “The arrival time of the caribou actually depends not at all on the weather during that spring or winter, but entirely on what was happening the previous summer,” Gurarie said. It’s common knowledge in the far north, he said, that “a crappy summer” for people means a good summer for caribou. “If it’s wet and cold and windy, then it’s a good year for the caribou, mainly because there’s a lot fewer bugs,” he said. If there were more insects in the previous summer, calving happens later in the year “and probably with less success,” Gurarie said. The caribou are in physically worse shape, after being bitten by insects all summer, and they spend a lot of time and effort avoiding insects. Often that means they move farther away from each other in search of relief from insects — which means there’s a “less coherent” mating season and “everything gets kind of messy,” Gurarie said. That seems to be linked with later migration arrival times, he said, possibly because it takes longer to rut and conceive under those circumstances. In turn, the calving is delayed — and doesn’t seem to be as successful. Insects are long gone by springtime, so researchers never thought much about them when it came to calving. “Insects were not really even considered, as they are largely absent during migration,” said Kyle Joly, a wildlife biologist with the National Park Service. The idea that the summer interactions between caribou and insects can have indirect, long-lasting effects on subsequent migrations is “novel,” he said. The link between arrival time at the calving grounds and rates of calving success will be a focus in future research, Gurarie said. “This potentially interesting link between the summer conditions and the calving success the following year can be sort of a bellwether to predict what might happen the next year to those herds, before it even happens,” he said. 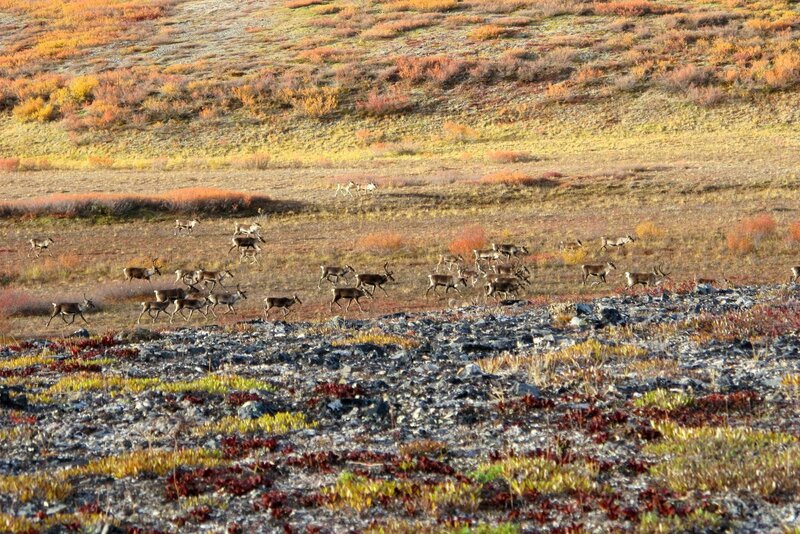 What does this pattern mean for caribou populations? “That’s the 500,000-caribou question,” he said with a laugh. That, too, will be a focus of future research.